The nave and south transept remain from a late C11 cruciform church. The north aisle and tower are late C14 and the early C15 chancel has good glass of that date. As its name implies, Westham stood at the west gate of Pevensey castle. There is a reference to a hospital of St Cross here in 1292 and though it is not known how this related to the church, a link is likely in view of its large size and the evidence (see below) of a cloister to the south of the church. A further hospital, dedicated to St John the Baptist, is mentioned several times after 1354; possibly St Cross was a precursor (See VCH 2 pp106-07 for fuller details). The church itself goes back to the late C11, the date of the south nave wall and transept, and the large dimensions suggest patronage from the castle. Much detail is later, but both have herringbone flintwork and the nave retains three round-headed windows above a string-course. Though C11 windows were often set high, the presence of the string-course would be unusual unless there was some kind of structure, perhaps a cloister, beneath which could have belonged to the hospital. The jamb of a similar north window, west of the C14 arcade, shows that this side was also aisleless. Curiously, it is not opposite the equivalent south window and is taller. 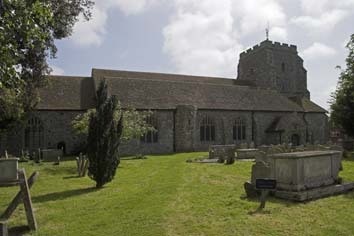 W H Godfrey suggested, without adducing any evidence (3 p114), that the nave was originally longer, but was curtailed when the C14 tower was built. Only the east wall of the north transept survives, as it was incorporated in the aisle, and like that of the south transept, it shows the outline of an arch. These probably led to apsidal chapels and it is likely that the C11 chancel was also apsidal. The plain C11 arch from the nave into the south transept remains. A C13 lancet in the arch in the east wall of the south transept, though renewed externally, shows that the apse was soon removed. 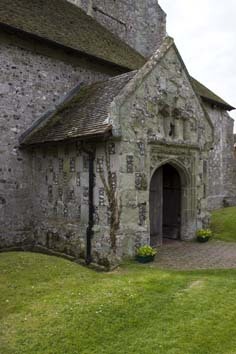 A plain, pointed south doorway in the nave is too renewed for dating. 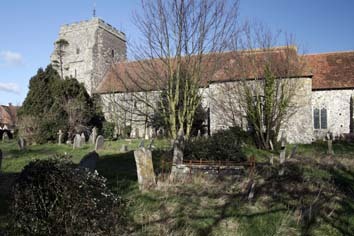 In the late C14, the north aisle and tower were added. The squat, broad proportions and big diagonal buttresses of the tower have been attributed to the need for stability on marshy ground (ibid). The detail is typical of the period, with battlements, a moulded doorway and trefoiled openings, which are mostly renewed. The arch reverses the usual arrangement, with moulded responds and a plain head and the large three-light west window resembles those of the aisle. All have panelled tracery and flattened ogees in the heads and there is a moulded north doorway. The tracery of the aisle windows shown on the Sharpe Collection drawing (c1797) is missing in Adelaide Tracy’s drawing (1855) (IV p47), but the restoration is reliable. The east wall of the north transept was kept as the east end of the aisle and received a gable, whilst there is a smaller window of panelled tracery in the blocked arch of the former apse. The arches of the five-bay arcade have two hollow chamfers and octagonal piers, whilst a clerestory is lacking. The chancel was rebuilt or remodelled about 1420 and there is no sign of earlier work. The big five-light east window has two tiers of panelling in the head and each side has a three-light one with panelled tracery; an additional square-headed one to the south has pierced spandrels. A blocked segment-headed north doorway led to a sacristy, of which the start of the walls is visible. The chancel arch is also of c1420, with slender semi-octagonal responds and a head of two hollow-chamfered orders. 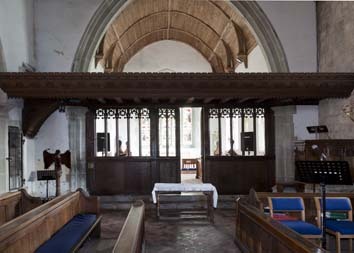 The chancel has a boarded wagon-roof and the others, except the north aisle, were replaced at this time as well. That in the nave has queenposts rising from braced tiebeams with wallposts resting on small horizontal timbers on two corbels and that in the south transept is similar but simpler. The hipped ends of the aisle and transept roofs are later, probably post-Reformation. A polygonal rood-stair turret, likely to be contemporary with the new chancel arch, projects from the aisle. The rood ran across the church, for there are the upper and lower entrances of a second stair east of the north arcade. Around 1500 a north porch of flint and stone chequerwork was added, with a triple niche above a four-centred arch with traceried spandrels. West of the aisle, a vestry of the same date has a three-light square-headed window and a depresAs well as the hipped roofs, a C18 or early C19 timber-framed window in the south transept has somehow survived, but the main change before the mid-C19 was the loss of the tracery in the aisle windows some time after 1797. The south transept was in use as a school in the mid-C19 (Hussey p302), which may explain its present bare appearance. In 1873, tenders were sought for a restoration by H E Rumble (B 31 (14 June 1873) p xiii). This must have been at most partial, for there was a further one in 1876 by Paley and Austin (CDK 1876 pt 2 p93) that was costed at over £3,300, though that included new roofs, which were not carried out. In 1928 there were problems with the foundations (3 ibid) and repairs continued for some time, for in 1937 W H Godfrey (who was probably involved) reported the finding of the C11 north window jamb (4 p156). Altar stone: (Lady chapel) Re-used as a tombstone in the floor of the church in 1692 and thus lacking two of the carved crosses. Consecration cross: (East wall beneath the window) Flint set in stone and probably contemporary with the chancel. Font: C15. Large with trefoiled arcading on both stem and bowl. 1. 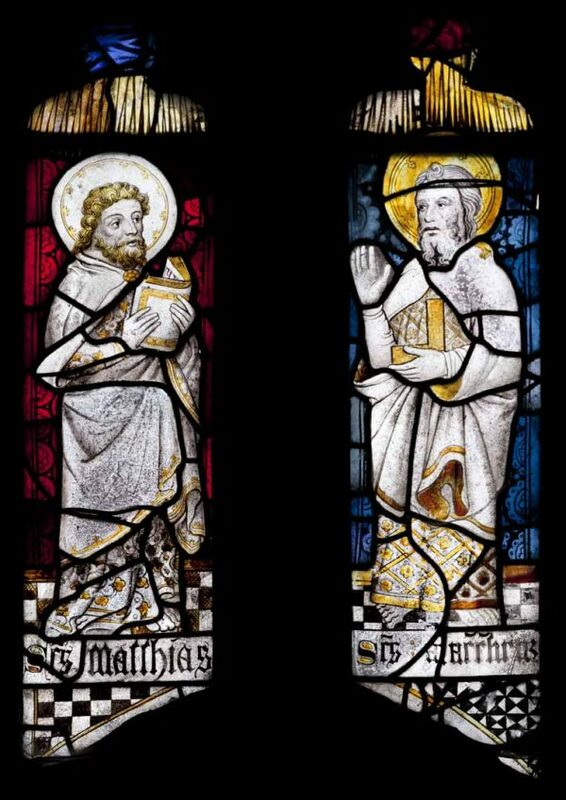 (East window – head) c1420, including 13 figures on white glass, identifiable from their attributes, e g St Peter with his keys, as Christ with the twelve Apostles, though not all are as obvious. The tops of the main lights contain the pinnacles of canopies. The lower parts are by Heaton, Butler and Bayne, 1903 (Bayne p126). 2. (North chancel window) C15 diamond-shaped quarries decorated with flowers and lion’s heads. 3. (North chapel, east window) Attributed to Heaton, Butler and Bayne (www.stainedglassrecords.org, retrieved on 18/2/2013). The window is in poor condition, but is remarkable because of the seemingly photographic representation of a woman in the head. This is presumably Louisa Blanche Foliambe who is commemorated. 4. (South nave, third window) J Powell and Sons, designed by —- van Daele with one figure possibly by E Penwarden, 1919 (Hadley list). 5. 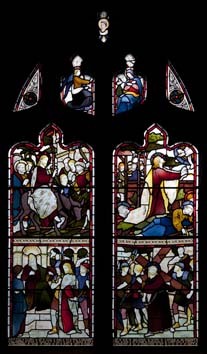 (North aisle, third window) Heaton, Butler and Bayne (signed), 1923. Mass dial: (by south doorway of nave). 1. (Chancel) Two C13 tombstones with floreated crosses. One was adapted as the tombstone of Philippa Hodson (d1602) and the crude but fuller inscription shows that the other was re-used in 1694 as the tombstone of Abraham Kenchley. 2. John Thetcher (d1649) draped tablet with Corinthian columns and a skull at the base. Attributed to J and M Christmas (BE(E) p660). Niche: (East respond of north arcade) Late C14. Small and trefoil-headed. Paving: The main body of the church is paved in brick, laid in herringbone fashion. This is likely to be C17 or C18, like the square tiles in the south transept. 1. East end of aisle) Plain late C14. 2. (South transept) C13. Small with two trefoils in the head. 3. 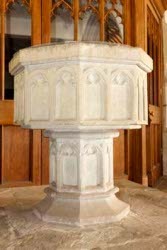 (By pulpit) Small and plain C13. Screen: Much restored C15 with traceried lights. Removed in 1876, it was reinstated in 1923 by Sir W Tapper (BE(E) ibid). The rood-beam also lasted until one of the restorations (SAC 39 (1894) p52), but the present loft is C20. Stoup: (By west doorway of tower) Worn, but probably late C14. My thanks to Nick Wiseman for the colour photographs.